Sweden's tallest residential building is the HSB Turning Torso, a sculptural sustainable skyscraper that gently spirals as it ascends above the skyline of Malmo. Designed by renowned architect, sculptor and structural engineer Santiago Calatrava, the gigantic tower stands 54 floors high and features a form inspired by the Spanish architect's studies on nature and human bodies. The fantastic tower is completely powered by renewable energy, and it twists a full 90 degrees from top to bottom. Turning Torso opened its doors in 2005, and upon completion it was the second tallest residential building in Europe and the highest in Sweden. 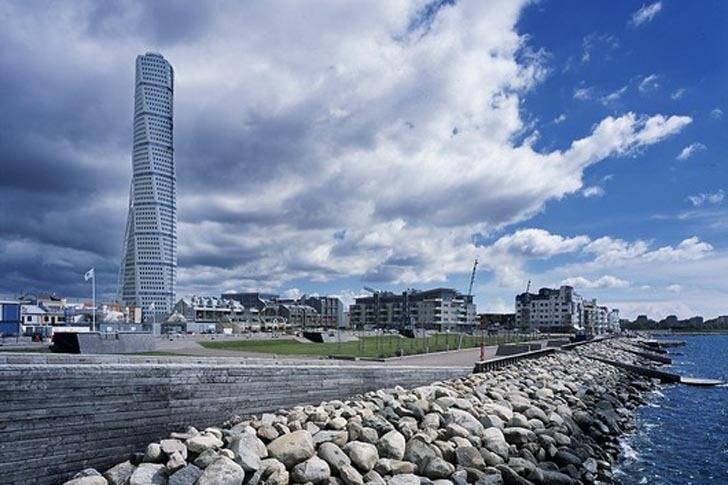 The sculptural skyscraper’s 623 feet and 54 levels make it stand out within Malmo´s blooming landscape. Designed as a symbol for the eco-friendly Swedish city, the tower is made from concrete, steel, glass, and recyclable aluminum. In order to follow the building’s twisting structure, which was inspired by a human body in movement, the glass façade features a complex double-curved shape. The residential tower has nine segments of five-story floors that form an irregular pentagon layout. The sculptural tower is supplied with 100% locally produced renewable energy. Each apartment monitors heat and water consumption, allowing inhabitants to plan their energy and living costs. The flats’ kitchens have organic waste grinding and disposal facilities that convert food waste into biogas energy. Santiago Calatrava’s building also features a high degree of energy and water efficiency, allowing Turning Torso residents to live and enjoy a conscious and sustainable life. Turning Torso opened its doors in 2005, and upon completion it was the second tallest residential building in Europe and the highest in Sweden. 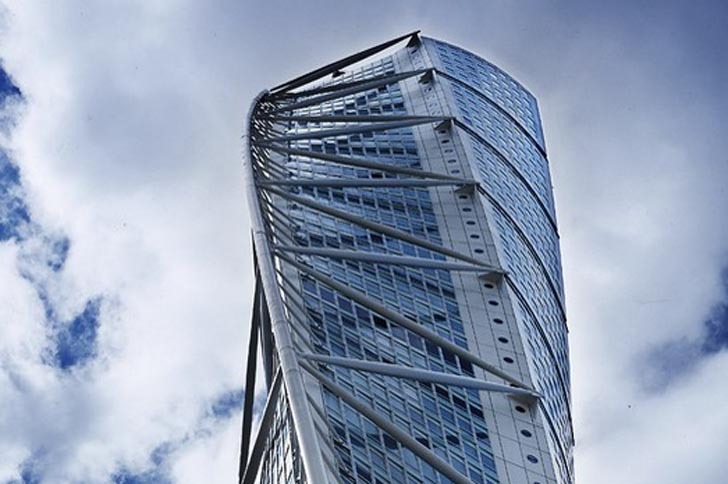 The sculptural skyscraper's 623 feet and 54 levels make it stand out within Malmo´s blooming landscape. Designed as a symbol for the eco-friendly Swedish city, the tower is made from concrete, steel, glass, and recyclable aluminum. In order to follow the building's twisting structure, which was inspired by a human body in movement, the glass façade features a complex double-curved shape. The residential tower has nine segments of five-story floors that form an irregular pentagon layout. 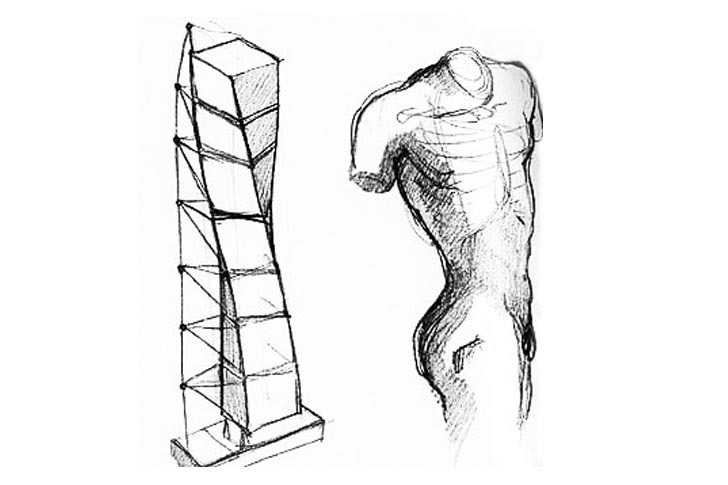 The sculptural tower is supplied with 100% locally-produced renewable energy. Each apartment monitors heat and water consumption, allowing inhabitants to plan their energy and living costs. Santiago Calatrava’s building also features a high degree of energy and water efficiency, allowing Turning Torso residents to live and enjoy a conscious and sustainable life.